Local charity Blood Bikes Scotland – based in South Queensferry – have become the latest big winners from Scotmid Co-operative’s Community Connect initiative – being awarded funding of £15,000 to extend their service into Fife. Scotmid launched the initiative last year to help support charities, community projects and good cause groups continue the valuable work they do in communities and this was the inaugural awards in the East Member Region, encompassing Edinburgh, Fife and the Lothians. The funding for the initiative, which sees local groups win a share of £25,000 generated from the sale of single-use carrier bags to support their ongoing work in the local area. The other Community Connect award winners were Prestonpans-based Harlawhill Day Care Centre, who were awarded £7,500 and West Lothian’s Broxburn Family Centre, who scooped £2,500. Scotmid members collected votes by swiping their Community Connect card after every in-store purchase and then voted for their preferred good cause group either in the shop or by attending last night’s Ordinary General Meeting at Murrayfield (Monday 1 October). Blood Bikes Scotland provide a professional, free and urgent courier service to Lothian and Borders hospitals and trusts. A small team of dedicated volunteers provide the service outside of normal office hours; delivering urgent medical supplies, blood samples, baby milk, medication or test samples to Accident and Emergency departments, wards and home addresses. 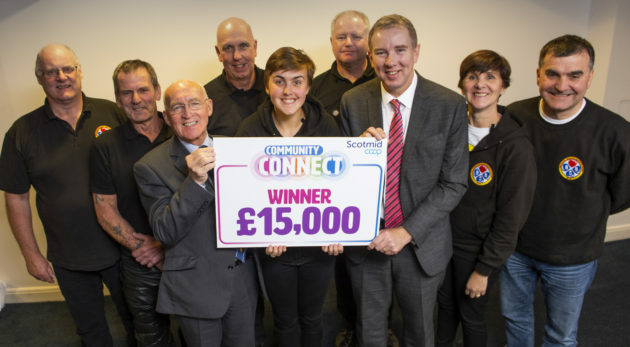 The Community Connect funding of £15,000 will go towards purchasing a new motorbike, which will enable the charity to expand the service they provide into the Fife area. Blood Bikes Scotland Chairman John Baxter said: “We’re absolutely thrilled to have been awarded £15,000 through Scotmid’s Community Connect initiative. “Special thanks to all the Scotmid members, who voted for us – it will make a significant difference to what we do and the service we’re able to provide. Scotmid Co-operative President Harry Cairney said: “Congratulations to Blood Bikes Scotland and all the Community Connect award winners. “This was a milestone event – the first-ever Community Connect awards in Scotmid’s East Region and the vote was extremely close, so thanks to all our members who helped to determine the outcome. “Our core purpose is to serve our local communities and improve people’s everyday lives and Community Connect goes towards enabling us to achieve those goals. 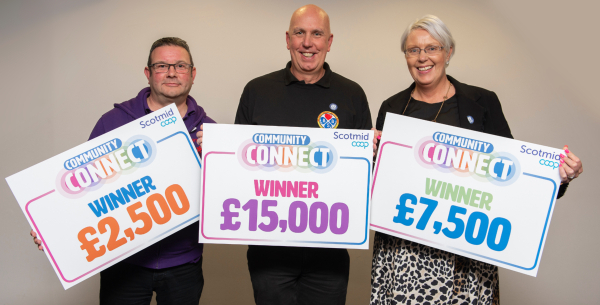 The short-listed Good Cause Groups for the next cycle of Community Connect funding will be announced next week and the award winners will be announced at Scotmid’s Annual General Meeting in April. Below image: Broxburn Family Centre’s Raymond Branton, Blood Bikes Scotland’s John Baxter and Harlawhill Day Care Centre’s Fiona Mitchell celebrate becoming the first-ever Community Connect award winners in Scotmid’s East Region.